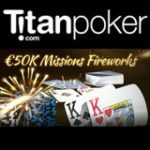 Win your share of €20,000 in prizes in the latest Titan Poker Twist & Win promotion which runs from 31st August - 6th September. Play Twister Poker jackpot SNG tournaments and win entries to the daily freerolls where you can win cash and tournament tokens. All the action starts from this coming Monday and runs for one week only, don't miss out on your chance to win. New players get a massive 200% bonus up to €1,500 when making a first deposit, get twice your deposited amount as a pending bonus. 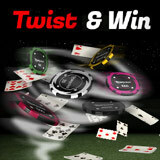 Twister Poker is a new format of three player SNG games with a win takes all prize structure. 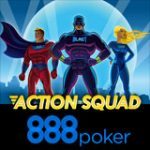 The prize pool is randomly generated when players are seated at the table and could be up to a 1,000 times the buy-in amount. 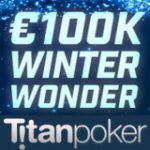 Titan Poker are running a promotion with over €20,000 in cash and tournament tokens to be won. To qualify simply play the required amount of Twister Poker SNGs to get your token to the freerolls. Get your tokens to the daily Titan Poker Twist & Win Freerolls or the Twist & Win Freeroll Final, see below for more details. Download Titan Poker - double your deposited amount as a pending bonus up to €1,500. Play five Twister Poker SNG tournaments and get a freeroll token, players can claim up to four freeroll tokens per day. 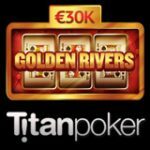 Play twenty Titan Poker Twister Poker SNG tournaments and get entry to the final freeroll where there is a €6,000 prize pool. 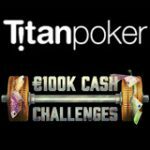 The Titan Poker Twist & Win Freerolls are limited to the first 5,000 registered players, register early to avoid disappointment. Note that all unused freeroll tournament tokens will expire on 7th September, all Twister Poker tokens won from the freeolls will be valid for 30 days from the date of issue. Titan Poker is one of the top 5 online poker rooms in the World and the flagship website for the iPoker network. Play the new Twister Poker SNG games for your chance to win up to 1,000 times your buy-in amount. 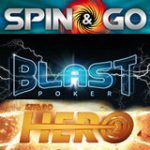 Twister Poker SNG games have buy-ins ranging from €1 up to €10, win up to €10,000 in cash.